A farmer dries coffee in Bushenyi District. After several years of what you would call stagnation, Uganda's leading export commodity, coffee, is now on an upward move. Latest statistics indicate that both volume and value of Uganda's exports at the international market increased. In terms of volume, Uganda contributed to the global coffee exports market in the month ending January a total of 401,930 (60kilogramme) bags. According to Uganda Coffee Development Authority (UCDA), during this period, which is the fourth month on the coffee calendar, the country earned in terms of revenue $43.66 million (Shs158 billion) up from $42.2 million (Shs153 billion) earned the previous month. Experts in the industry say, if this trend continues, the country's campaign to reach the 20 million bags at least by 2025 will be achieved. The UCDA's executive director, Mr Emmanuel Iyamulemye, attributes this performance to the new crop which has started fruiting. "We have seen more than 500 million seedlings which were planted three-four years ago start fruiting and this has contributed to the volumes that we see now," Mr Iyamulemye shared. However, he said with all the other agronomical practices in place such as rehabilitation of the existing crop and expansion to new areas such as Northern Uganda, parts of Busoga and greater Bunyoro the volumes will continue growing. With all these interventions, Mr Iyamulemye is optimistic that by end of this year, the country will hit the 5 million kilogramme-bag mark. Cumulatively, the UCDA report shows that the coffee exported from February last year until January this totalled 4.77 million bags worth $549 million (Shs1.9 trillion). The 4.7 million bags exported indicated an increase of about 2.1 per cent from the 4.6 million kilogramme-bags exported the previous year. The country had stagnated at 3 million bags for years and because of the increased planting and good agronomical practices, production has increased. Robusta, the country's leading coffee species comprised 3.75 million bags, which fetched the country $413 million (Shs1.5 trillion). 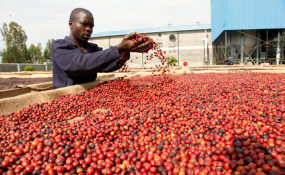 While Arabica, which is mainly grown in the highlands of Eastern, Uganda fetched the country $136 million (Shs459 billion) out of the 1.02 million kilogramme-bags the country exported. At least 79 per cent of the total volume was exported by 10 exporters, out of 42 who performed during the month compared to 77.09 per cent in December 2017. Projections for the month of February experts say, the country's exports were tagged at 350,000 kilogramme-bags as the main harvesting season in Central region ends.